WeLoveAnyCar.com has posted the collected reviews of 239,486 car owners and has built Britain's No.1 Car Review site. The size of the survey dwarfs that of known players like What Car, AutoExpress, the AA, Auto Trader and even Which Car. Covering every make and model, WeLoveAnyCar.com says its survey is more accurate than well-known motoring magazines and sites which could be misinforming drivers choosing their next car – because they just don’t have the facts. WeLoveAnyCar.com spokesman said, "This is a closed survey - we invite people to submit a review only if they own, or have owned, that car. In the last ten months, 81,234 people have done just that on just about every make and model of car on British roads. Last week we asked other owners, of the exact same make and model, if they 'agreed' or 'disagreed' with the review on their car and nearly a quarter of a million did. That makes WeLoveAnyCar.com the best for information when choosing their next car." Much has been reported about review sites, TripAdvisor for example, and reporters and the public want to know; How accurate are reviews? Who really posted them? Are there enough reviews to give a balanced view? What Car, one of the best known publications, has just 4000 car reviews. This means it cannot even begin to cover all makes and models. Many of these are new car reviews by journalist and not the tried and tested opinions of the likes of salesmen who drive thousands of miles on UK motorways, daily commuters and the mums and dads on daily school run. Last year 7 million used cars were sold whereas only an estimated 700,000 new cars were sold to private buyers meaning that used car reviews are more important to the majority of prospective car buyers. Used car buyers have questions like: Is that car reliable? Would you recommend it? Is it really economical? Not only that, people want to know day to day things like: Is it easy to park? Does that hard top cabriolet leak? (many do). The Which Car 2013 survey claims 47,514 people told them about 57,182 cars. Reviewers were allowed to by-pass registration number checks, anyone could submit a review and many people submitted 2 or more car reviews. Like What Car, the Which Car survey focused on elite car owners - 46% of the cars reviewed were bought from new and 19% nearly-new. In the age of freely available information, Which Car costs a hefty £83 a year although buyers can access most other Which information. The AA, surprisingly for the mother of all motoring organisations, has only 1,200 new car reviews. Moreover some of these were submitted by journalists as long as 10 years ago. Parkers claim ‘nearly’ 40,000 car reviews but a closer look reveals that 33% of them were submitted 3+ years ago. Other on-line sites also have an issue with aged reviews. Car Buyer – often found at the top of Google searches for car reviews, doesn't claim an overall figure. However, if Britain’s most popular car, the Ford Fiesta, is searched on the site, 413 reviews are found but careful reading reveals that nearly 50% were made 3 or more years ago. Honest John, the cheekily named car website, has just 12 Fiesta reviews. WeLoveAnyCar.com has 1,641 Ford Fiesta reviews all made in the last 10 months. There are a number of car review sites – many built to attract the attention of Google and to promote income through advertising – but none seem to focus on used car buyers. Even mums get a poor deal with sites like Mumsnet featuring only What Car reviews in a commercial tie up. Countless mums have entered reviews on WeLoveAnyCar.com and it is interesting to see what cars they like. For Example, the Vauxhall Zafira is a favourite amongst mums with young families who are expected to be a taxi not just for their kids but their dogs, other people’s kids and even the odd bike or two. WeLoveAnyCar.com has 7,278 Vauxhall reviews and this includes 1,055 Zafira reviews. The WeLoveAnyCar.com car review database is expected to reach 100,000 reviews by the end of 2013 and will conduct another vote by invitation again in the New Year. 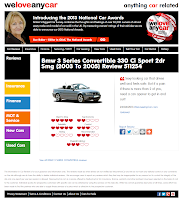 Notes: WeLoveAnyCar.com has 80,848 full car reviews on 2,070 models from 73 manufacturers as at 30th October 2013. All reviews were gathered in the last 10 months. 231,369 car owners either agreed or disagreed with a review made by a car owner of the same vehicle. All facts and figures on other car review sites have been gathered from publicly available information published on their websites on 9th October 2013. Every effort has been made to give a true reflection of the figures quoted but WeLoveAnyCar.com cannot guarantee accuracy. WeLoveAnyCar.com claims to be the biggest car review site in the UK and is currently investigating worldwide figures. WeLoveAnyCar.com is happy to consider further information from any of the sites mentioned, or those which are not, to help it gain a better understanding.